A starburst galaxy is a galaxy that’s producing stars at a very high rate. The rate of star production is so high that it would use up the available gas and dust in a time period much shorter than the typical age of a galaxy. 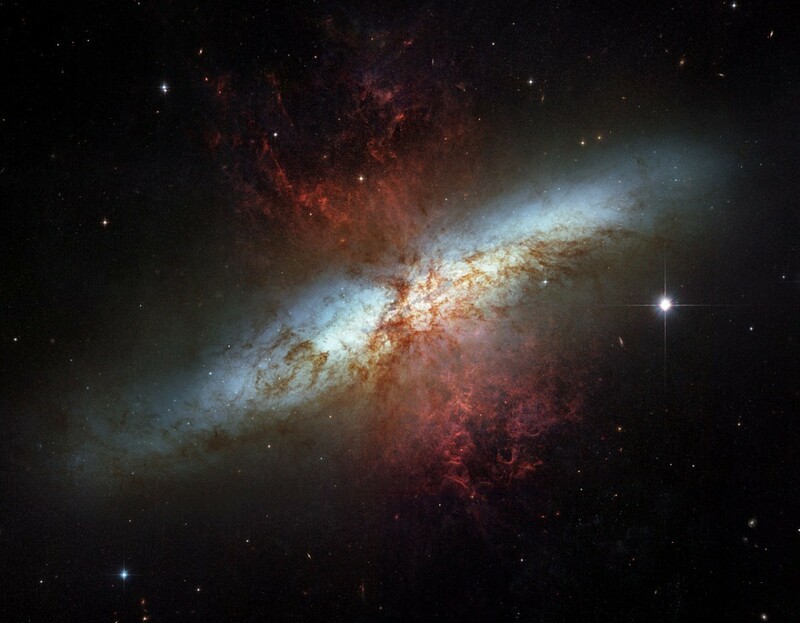 While the age of a typical galaxy is on the order of billions of years, a starburst galaxy would use up all the available dust in about 10 million years. This means a starburst galaxy must be in a galaxy in an active phase of star production, rather than being a separate type of galaxy. We often see starburst galaxies in the midst of a merger or close encounter with other galaxies, which would indicate that starburst periods can be triggered by galactic collisions. There is observational evidence that starburst galaxies were much more common in the past, which implies that young galaxies often enter a starburst period in their youth before settling down to a more steady rate of stellar production. But how do you verify such an aspect of galactic evolution when when it occurs on a scale of billions of years? The trick comes from the fact that the universe is expanding, and that we can observe galaxies very, very far away. Because of the expansion of the universe, more distant galaxies appear to be receding from us faster than closer galaxies. The more quickly a galaxy recedes, the more its light is redshifted due to the Doppler effect of light. This means we can gauge the distance of galaxies by their redshift. This redshift factor is typically given in a quantity known as z. This z is zero if there is no redshift, and gets larger as the redshift increases (and therefore is at a greater distance). By measuring galaxies at greater redshifts we therefore observe galaxies at greater distances. Since it takes light longer to reach us from those galaxies, we are effectively looking at galaxies from further in the past. As recently published in Nature a team used this very method to look at the evolution of galaxies. Of course to look at starburst galaxies, the team needed a method of distinguishing starburst galaxies from regular ones. To do this they used an effect known as gravitational lensing to identify so-called dusty starburst galaxies. Gravitational lensing occurs when light from a more distant source is deflected by the mass of a closer galaxy. Basically the light is bent by the mass of the galaxy, which distorts the background light. In the figure below you can see an image of several galaxies in gray with the gravitational lensing effects shown in red. Gravitational lensing by starburst galaxies. Credit: J. D. Vieira, et al. Dusty starburst galaxies are ones that are actively producing stars but still have a great deal of dust and gas in them. As a result they are relatively bright for their size, but also are massive enough that they tend to gravitational lens background light in a measurable way. It is unusual to find a dusty starburst galaxy that does not also have a gravitational lens effect. So the team looked for relatively distant galaxies of a certain brightness that demonstrated gravitational lensing, which they could identify as starburst galaxies. They then measured the redshifts of these galaxies, determining their distances. By looking at the distribution of starburst galaxies as a function of redshift they could determine how the number of starburst galaxies changed over time. What the team found was that starburst galaxies were much more common in the past. About a thousand times more common in the early universe than today. It would seem then that early galaxies often entered a starburst period of very active star formation. Triangulum II: A Dark Matter Galaxy?